The words “healthy” and “affordable” are rarely found next to each other, but Sunflower Cafe challenges the norm by offering $5 vegan quesadillas and other appetizers every week during happy hour. Nestled in the heart of Nashville’s Berry Hill neighborhood, Sunflower is a cozy, vegetarian restaurant. But don’t let the word “vegetarian” stop you from sampling Sunflower’s numerous tasty offerings. If you hear “vegetarian,” and the first thing you picture is unseasoned tofu plopped onto a white plate, it’s time for you to embrace the new season of being a vegan. 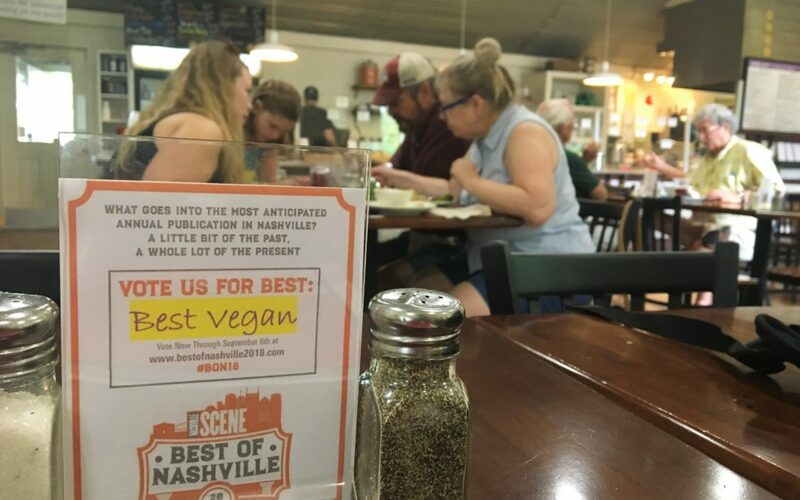 Welcome to Nashville, where select restaurants are dedicated to making vegan and vegetarian food DELICIOUS. Now, if you’re a fairly health-conscious foodie like me, you love trying new places. But not when it costs $15-$20 per plate – that’s just not realistic for a college student. However, what if I told you Sunflower Cafe offers $5 vegan quesadillas during their 3-6 p.m. happy hour from Monday through Friday? Would you start cartwheeling around your dorm room? Good, I thought so. Keep rejoicing, just as “happy” hour would have you do. 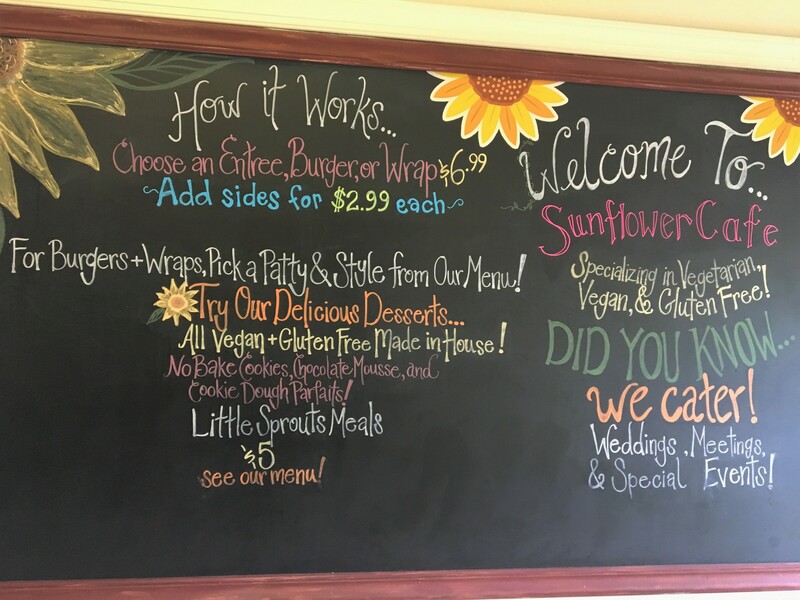 Yes, at Sunflower Cafe, you can eat guilt-free without breaking the bank. One of my favorite things about Sunflower is that my non-gluten-free father loves their food. He actually chooses to go to Sunflower sometimes. That, my gluten-free/vegan community, is what we call a win. But back to drooling over Sunflower’s happy hour. You can choose from seven vegan (and mostly gluten-free) appetizers, all of which are $5. 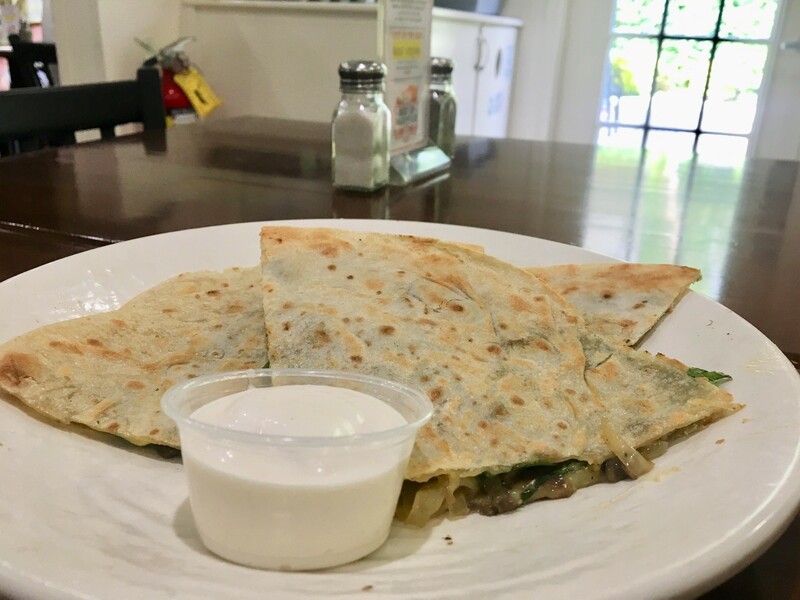 I chose my favorite: the filling Spinach and Mushroom Quesadilla. Since I’m gluten-free, I subbed a brown rice tortilla in for the traditional flour tortilla (for a small upcharge). Because I’m high-maintenance, I also ordered garlic aioli in place of the traditional siracha aioli. Y’all, it’s wonderful! You really can’t go wrong at Sunflower. If you go during lunch, try their entree of the day, like the gluten-free and vegan lasagna or enchiladas, both of which are heart and tummy-warming. Also, be sure to taste their $7 veggie burgers or the spicy Buffalo Tempeh Salad, which comes with a house-made vegan ranch dressing. Don’t let this semester pass by without giving Sunflower a shot, whether you normally eat gluten-free and vegetarian food or not. Either way, it makes for an enjoyable and refreshing meal. To plan your trip to Sunflower Cafe, check out their website: www.sunflowercafenashville.com.